The M6 Motorway in Cheshire reopens after a crash involving several vehicles forced the closure. North West Motorway Police officers were at the scene after the crash, at about 22:30 GMT. And drivers who were stuck in the closure were released when the road reopened at about 06:00 GMT. Highways England said it happened last night on the Northbound carriageway between J17 and J18. A “large diesel spillage” has also been reported. The northbound carriageway of the M6 was shut between junction 17 (Crewe/ Sandbach) and junction 18 (Middlewich). Police say a diversion is in place and are asking motorists to follow the ‘solid diamond’ symbol (see diversion route below) – while eyewitnesses report a large number of emergency vehicles including fire engines and recovery vehicles making their way to the scene. The police paid tribute to the patience of the drivers but so far have not released any information about the collision and any fatalities. This stretch of the motorway has been under refurbishment for a few years and is being upgraded to a ‘Smart Motorway’. 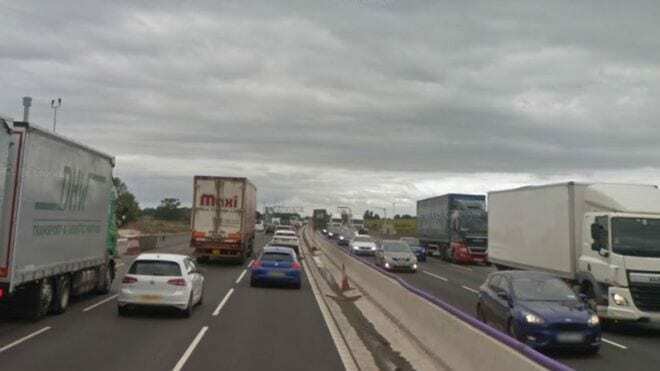 However, eyewitness accounts and reports have suggested that many lorry drivers are often found driving aggressively and speeding through these controlled zones, where the lanes are narrow and often congested. The project is due to be completed in 2019.